Spring Migration is in full swing which means there will be a lot of interesting birds to see if you spend a little time looking around your yard, or at any of our wonderful parks and greenways. If you are going out for your morning, or afternoon walk don’t forget your binoculars because the neo-tropical migrants are passing through, or arriving in middle Tennessee every day on the way to their summer breeding areas. Warblers, Vireos, Blue-gray Gnatcatchers, Tanagers, Swallows, Hummingbirds, and many other species are there for the viewing if you try. Early in the morning, between 6 am and 10 am are best to see some of these birds because many of them migrate at night then settle down in the mornings to feed and rest. The first Ruby-throated hummingbirds to arrive or pass through TN have already been sighted. Usually one, maybe two hummingbird feeders at this time of year is enough. Don’t bother filling your feeder to full capacity at this time as the feeders are of little interest to them this early. In the coming weeks at your feeders expect to see the always popular Rose-breasted Grosbeaks and Indigo Buntings. Of course American Goldfinches are here in abundance year round but are now putting on their bright yellow spring plumage. 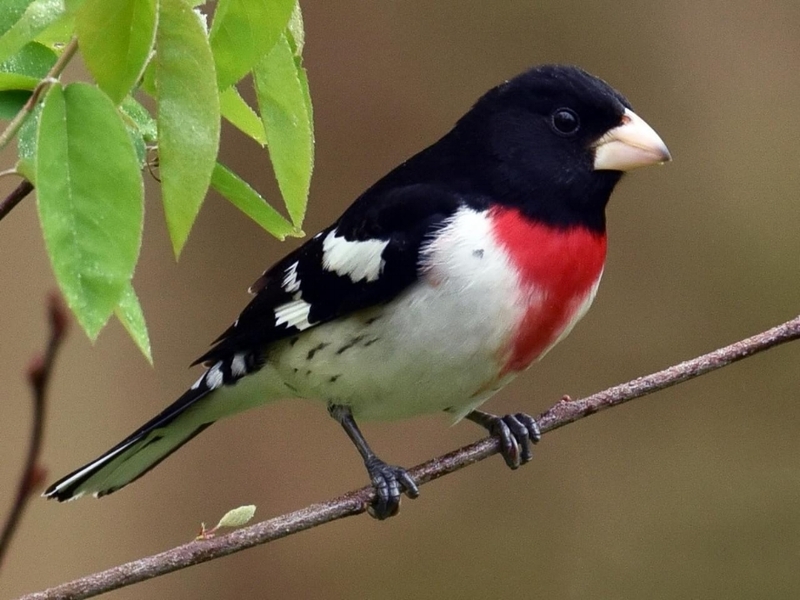 RB Grosbeak males are quite handsome with their black and white plumage and v-shaped splash of red on the chest, while females are brown and white with heavy streaking. Both have the distinguishable heavy beak. These birds may be seen in good numbers at your feeders. In years past I’ve seen as many as a dozen at a time, or some years just a few. They are fond of several types of seeds and feeders. Sunflower and Safflower are the more preferred seeds, while platform, hopper, and tube type feeders all work well. Let us know when you see one. Interestingly there are still good numbers of our winter visitors like Purple finch, Pine Siskin, and even Red-breasted Nuthatches in the area. Reports of Bluebirds with completed nests and with eggs are sprinkling in. It’s still relatively early and plenty of time to attract Bluebirds to a nest box. In years past I would not see a first Bluebird nest until late April. For daily bird sightings reports of migrating birds you may want to subscribe to TN bird e-mail list, or visit Tennessee Birding on Facebook. There is still time to register for Richard Connors bird identification class at Radnor Lake this spring. The 5-week class runs Tuesday mornings from April 9th to May 7th, and includes classroom sessions and morning bird walks. Radnor is a premier location for spring migrants and those migrants are often heard more easily than seen, so this spring class will emphasize "birding by ear". We will work on bird identification by sound as well as by sight. The class is open to beginners, but some prior knowledge of our local birds will be helpful. There is a fee for the 5 week class with part of the proceeds going to Friends of Radnor Lake. To register for the class contact Richard at rconnorsphoto@aol.com or 615 832-0521. With spring almost here there is so much to anticipate happening with regard to birds. Many of our year round resident songbirds have begun courtship. Currently there’s a lot of singing and territorial squabbles going on. We’ve had some reports of the always eager Carolina Wrens building nests. If you haven’t seen any Bluebird activity at your nest boxes yet don’t despair, there’s still plenty of time. Although some Bluebirds will start nesting in March the majority of Bluebirds tend to begin actual nesting closer to mid-April. Other cavity nesters like Chickadees, Carolina Wrens, Nuthatches, and Tufted titmice tend to start a little earlier. Make sure you’ve done some maintenance on your nestboxes and cleaned out old debris from last year’s nests. The old nest debris can attract insects, like ants, that can be a major problem for baby birds. Male Bluebird. Photo by Eli. Migration is not in full swing yet, however, any day now Purple Martins and other members of the Swallow family will be moving into and through TN. 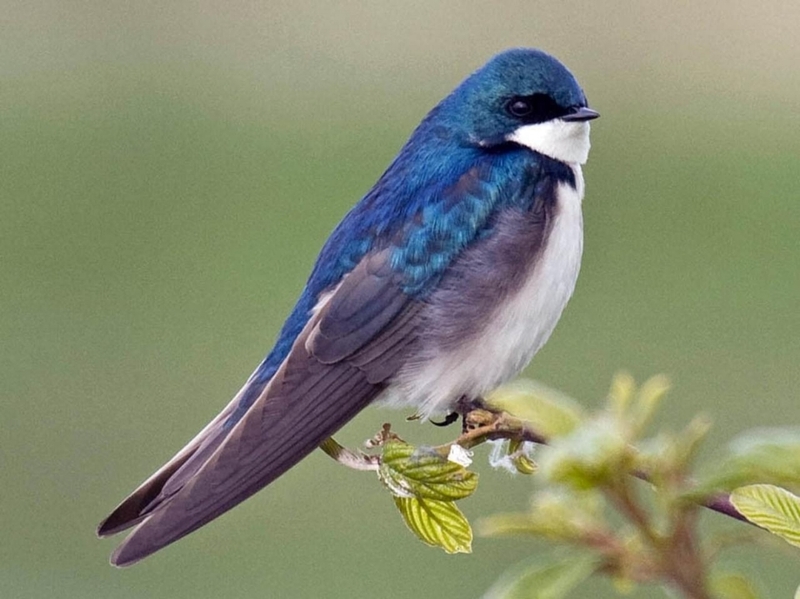 Tree Swallows, Rough-winged Swallows, Barn and Cliff Swallows are among the earlier migrants to return. Every day birds from Central and South America are moving closer to middle TN. By the last week of March and first week of April the first hummingbirds of the year will begin arriving or passing though on the way to their summer breeding destination. That’s right! The first Ruby-throated hummingbirds to arrive are just about 5 weeks away. For birdwatchers this is a most exciting time. Warblers, Vireos, Tanagers, Indigo buntings, Orioles, and Flycatchers will soon be pouring into and through middle TN. White-eyed Vireo. Photo by Eli. Look for Rose-breasted grosbeaks and Indigo buntings to start arriving at seed feeders around mid-April through mid-May. Rose-breasted grosbeaks especially like platform feeders but will manage very well on tube type feeders, too. They really like sunflower and safflower. Indigo Buntings also like a variety of seeds but seem to prefer feeding on the ground. Keep the suet feeders going and you will be amazed by the increase in suet consumption well into the spring. Woodpeckers take great advantage of the suet while they are nesting. Raising young is high energy work and the suet is an easy high energy food source. I typically see suet consumption double at my house during the spring and early summer months. Indigo Bunting. Photo by Eli. Get your feeders cleaned up and your binoculars ready. Clean feeders are very important in reducing the chances of avian disease like avian conjunctivitis which is very common among the finch population. A good cleaning with warm soap and water or a mild bleach solution is recommended. Speaking of finches, have your Goldfinches suddenly disappeared? Or suddenly appeared? Are you seeing them beginning to change to their spring-summer plumage? Goldfinch numbers at your feeders can change daily during the early spring as there is a lot of movement among flocks. Don’t be surprised or think you’ve done something wrong if you don’t see finches for a few weeks. This is normal spring activity for Goldfinches.